Just like the fashion industry, custom home trends and design is ever-changing. Because it’s not as easy to recycle the permanent details of your space as it is last year’s sweaters, custom home building becomes all the more calculated. From kitchen appliances to your outdoor lounge area, industry experts have weighed in on the hottest custom home trends of 2016 that have both the longevity and elegance you desire. Kitchen islands with a waterfall edge are nothing new; however, they seem to be making a comeback. Typically made of marble, wood, or granite, the waterfall island will close off the edges for a boxy look which may play up other design elements of your custom kitchen. 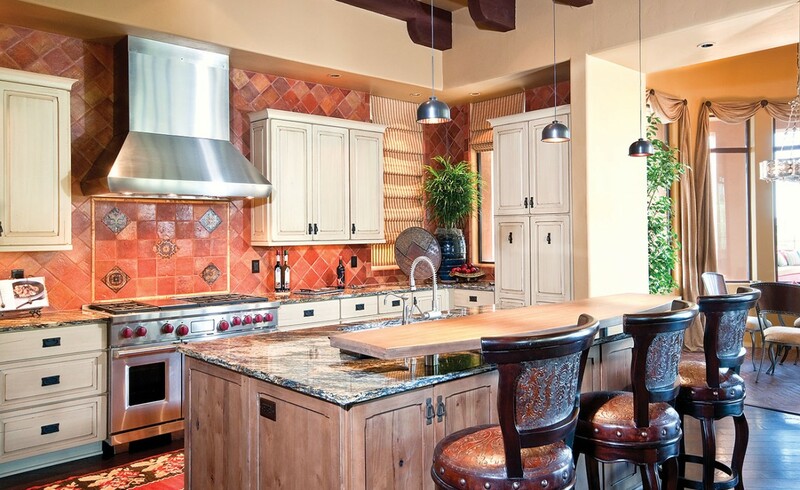 Double islands are in high demand as more homeowners claim the kitchen as a place for gathering and entertaining. Imagine more seating space as your guests munch on appetizers and you prepare the main course amid built-in cutting boards and extra sinks. White on white design doesn’t necessarily translate to minimalism. Design to your heart’s content; white countertops and islands that are becoming increasingly popular in 2016 will simply serve to open up your space. Workhorse islands are exactly how you’d imagine—spacious and fully functional. Plenty of room for seating, extra-large drawers and cabinets for storage, dual sinks…the workhorse island is the dream of parents and frequent hosts alike. Incorporating outdoor design elements into common indoor living areas is expected to be prevalent throughout custom homes this year. For example, the durability of outdoor furniture fabric is slowly making its way into high-traffic living rooms and dining rooms. It’s no surprise that blurring lines between the indoors and outdoors is a fast-rising trend. By embracing this open space concept, you get the best of both worlds—the comfort of your home and the beauty of the elements. Think floor to ceiling retractable walls. Rustic design is massively popular right now with everything from barn doors in the kitchen (lending flexibility to an otherwise closed-off room) to board and batten wainscoting in the entryway. As with any theme, your surrounding decor should complement the rustic feel. No longer exclusive to Europe, bidets are now a staple in custom American homes. They’re relatively inexpensive, eco-friendly, and far more hygienic than traditional methods of cleanliness. Combination toilets to include bidets leave you no excuse not to add this to your bathroom. Go vintage, use soft backlit lighting, or hang oversized wooden frames—just don’t neglect an elaborate mirror when designing your dream bathroom. Medicine cabinets are fine, but you can always find an equally functional space for your toothbrush. Make a statement instead. Loud walls are especially relevant in small spaces like a powder room. Want to be bold with mix and match texture, graphic prints or dark wallpaper? 2016 is the time for it so don’t be afraid to get innovative and audacious. How chic is a freestanding copper tub? Cool enough to gain plenty of attention in last year’s Best in American Living Awards showcases. Whatever the style—from rustic to modern to traditional—they’re here to stay. As the name suggests, a custom home is all about personalization and style. 2016 delivers homeowners a mix of fresh bourgeoning styles and recycled classics. You’ll never be able to predict what concepts will fall out of favor to professional designers, but staying true to your vision while incorporating contemporary trends is always a safe bet. This is, after all, your dream home. Here at The Residences at The Ritz-Carlton, Dove Mountain, our home design team works with you to build the custom home of your dreams. While our floorplans are a great place to start, you can customize your home with all the little features that make it your own. Learn more about us and contact us today.